Are they a mighty Wind, or a load of hot air? 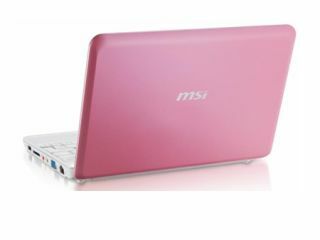 MSI, maker of computers and computer peripherals, has announced the launch of two new versions of its Wind netbook. First up is the lappie entitled the MSI U90 Wind. This diminutive computer weighs in at a minuscule 8.9 inches, utilises SUSE Linux OS and has a 1024 x 600 display. Hard-disk size is a healthy 80GB and price-wise the computer is a modest £269 to buy. Next up is the update to the original Wind model, the U100. Coming in with a 120GB hard drive and a 10in screen, the U100 has a price of £329 and runs Windows XP as its OS. Both the MSI U90 and U100 house a 1.6 GHz Intel Atom processor, 1GB RAM, a trio of USB slots, and Ethernet connection. A 1.3 megapixel webcam, Wi-Fi and Bluetooth 2.0 have been thrown in for good measure. And for those looking for extra connectivity, there's a SDHC card slot built-in. Both laptops come in black and white. If you prefer to add a bit of colour to your life, the old 80GB version of the U100 Wind is also shipping in pink for just £319.